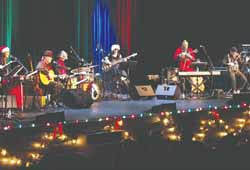 Antigo Daily Journal offers review of "Blue Canvas Christmas"
The Blue Canvas Orchestra drew a true crowd to the Volm Theater Sunday afternoon for an unusual, and tremendous Christmas concert. “It was great to see a full house for the concert,” Nick Salm, who spearheaded the project, explained after the theater had cleared. Salm explained that he and his wife Jeanette drew “positive comments from everyone attending this really special Christmas concert.” He added that some in the crowd asked if Blue Canvas can return for a 2019 show and expressed willingness to be sponsors if there is a decision to do it again. Those familiar with the orchestra and the Big Top Chautauqua knew well that it wasn't going to be a traditional Christmas concert. The performers reflected the well-known talent that exists among the orchestra members and the free-wheeling spirit of the Big Top Chautauqua at Washburn/Bayfield, where some of the Upper Midwest's finest music is performed every summer season under a big blue and white canvas tent. In fact, some of that spirit was on display with Bruce Bowers, a violin artist, who was shoeless during the performance. The were standouts across the stage, including Randy Sabien, who performed with the violin, mandolin and keyboard in addition to doing vocals. He came to the show wearing his traditional red smoking jacket. Salm said that Music in the Park and Antigo Music Association will benefit because the concert was so well attended, suggesting that it was a win-win setup for the hundreds of people who filled the seats and organizations that will benefit from it. The program closed with “Silent Night,” done in a little different style, but beautifully. The crowd sang with the closing song and with the voices of a full house joining, it was moving, and a signal that this will be an excellent Christmas season. Big Top Chautauqua will be holding an auction to liquidate the contents of the old Northern Edge Restaurant which it now owns. Future plans for the building include moving the main offices, box office and gift shop to this location. 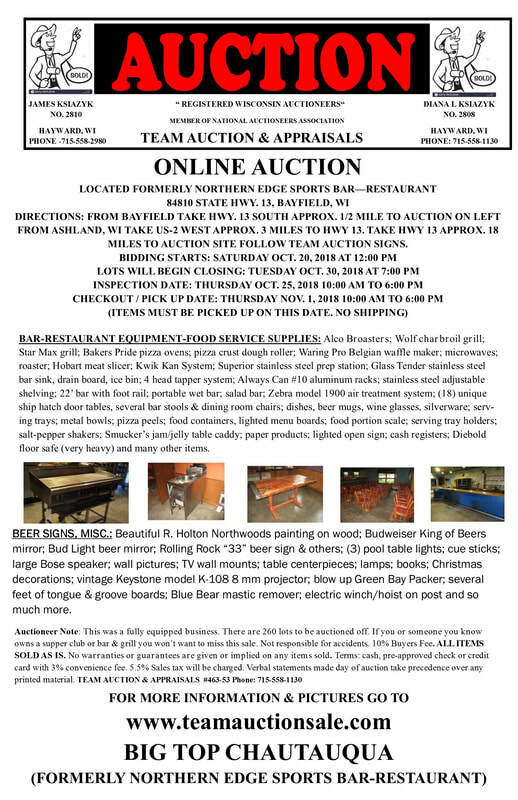 Big Top has hired Team Auction out of Hayward to liquidate all of the unneeded contents of the old restaurant including tables, chairs, kitchen equipment, broasters, pizza ovens, and lots of small wares. For a complete list of items and additional information, go to teamauctionsale.com. The auction starts October 20 and closes October 30. All proceeds from the sale will go toward improvements to the site. View the entire magazine HERE. ​Many people are wondering what Big Top is planning for our future. While the Board of Directors is at the beginning of their planning process, some information is known at this time and more will be forthcoming over the course of the next year.